Set within a golden landscape, a female figure serenely floats above a lotus blossom while six alien musicians whirl by on bubbly clouds. Her pink robes mirror the predominantly pale orange, yellow and pink of the water, land and sky—firmly embedding her within the tranquil scene. Pure Land, a photograph set within glass, is the counterpart of Mori’s three-dimensional video installation, Nirvana, 1997. Nirvana animates the imagery we see in Pure Land. Viewed within a darkened room with the aid of three-dimensional glasses, Nirvana’s audience was limited to a group of 20 people at a time. During the seven minute video, the central female figure would hum and whisper echoed rhythms as if meditating, while the little musicians floated around her. At the conclusion, a fan came on and blew cool, scented air into the audience’s faces. Through the integration of sensory elements such as three-dimensional imagery, sound, scent, and the gentle touch of a breeze, combined with the limited viewing audience, Nirvana created an immersive, intimate experience. As its photographic counterpart, Pure Land captures a moment of this experience, enabling the viewer a longer, perhaps more meditative, relationship with the work. Every element we see here has significance that may not be apparent at first glance—the serene landscape, with its golden sky, smooth pink land masses, and perfectly still water, is rich with symbolism. Pure Land is set during sunrise in the landscape of the Dead Sea, the lowest point on earth, called “dead” because the high salinity of its water does not support fish or plant life. In Shinto tradition, salt is used as an agent of purification. Floating in the water is a lotus blossom—symbol of purity and rebirth into paradise. 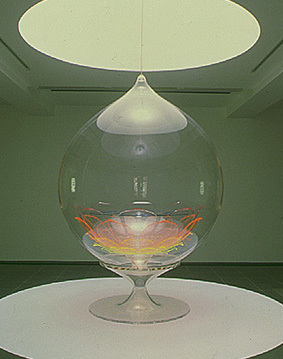 This blossom resembles one in Mori’s 1998 sculptural installation, Enlightenment Capsule (left), which featured a rainbow-colored acrylic lotus blossom set within a space-age capsule illuminated by sunlight. In both Enlightenment Capsule and Pure Land Mori blends traditional symbolism with futuristic elements. On the right hand side of the background of Pure Landis a fantastical object which resembles a playful futuristic spacecraft with arms. This may be a variation of a Tibetan stupa—a sacred Buddhist monument originally used as a burial mound. Through her imaginative reinterpretation of symbols steeped in tradition, the artist creates a timeless setting appropriate for meditation on death, purification, and rebirth. Beginning with the eleventh century in Japan, several paintings and sculptures were made on this theme, such as the Descent of Amida and the Heavenly Multitude (above). 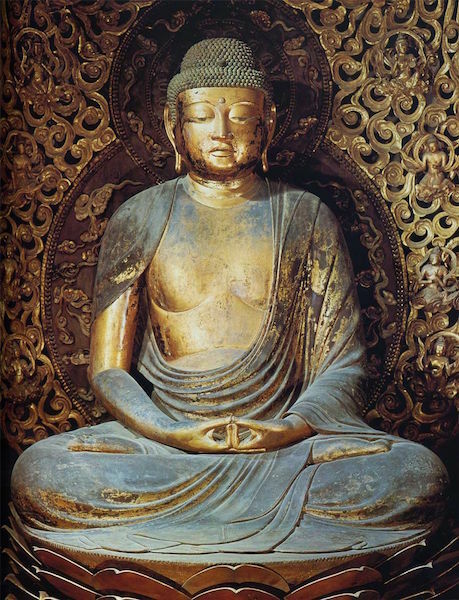 In this type of imagery, Amida Buddha, resting on a lotus blossom and holding his hands in a symbolic gesture known as a mudra, is typically surrounded by celestial attendants in a sea of swirling clouds. These attendants are boddhisattvas, enlightened beings who act out of great compassion to help others achieve enlightenment. In a sculptural example from Byodo-in Temple, 52 boddhisattvas fly on clouds on either side of Amida Buddha (below); some are seated quietly with their hands joined in prayer, some hold a lotus blossom to receive the soul of the deceased, while others are playing musical instruments. In Mori’s version, these celestial attendants are pastel-colored alien figures with large pointy heads and delicate bodies. Each figure plays a different instrument as they float on their light blue bubbly clouds. The two musicians in the foreground are blurred, as if they are flying quickly toward the viewer. These muscians appear again in a later sculptural installation by Mori, Oneness, 2003 (left). 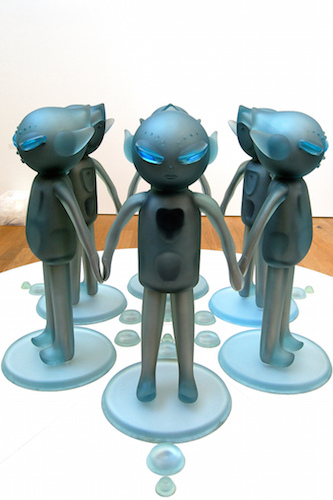 In this work, the six aliens are given three-dimensional form, complete with soft, flesh-like material. They stand in a circle facing outward as they hold each other’s hands. The viewer becomes an active participant in the work—when a person hugs one of the figures, its eyes light up and you feel its heartbeat. As in the Nirvana video installation upon which Pure Land is based, Mori seems to want to engage more than just the viewer’s sense of sight and for each participant to have a direct experience with the artwork. Perhaps more significantly, Oneness is a metaphor for bringing in the outsider, achieved through revealing commonalities of experience. The binding together of seemingly disparate realities is a central theme throughout Mori’s work. Another element typical in Mori’s work is for the artist to cast herself in the principle role, and Pure Land is no exception. The central female figure is the artist herself, wearing an elaborate costume and headdress, both of her own design. Born in Tokyo in 1967, Mori studied design at Tokyo’s Bunka Fashion College and worked part-time as a fashion model, which she originally considered a form of personal creativity. However, she found modeling an inadequate medium in which to express herself fully, so she began to stage elaborate tableaux, taking full creative control of the process, acting as director, producer, set and costume designer, and model. This recalls the practices of other photographers, most notably Cindy Sherman, as well as Yasumasa Morimura, the Japanese photographer notorious for substituting himself for figures in famous paintings throughout art history. In the Pure Land photograph, Mori’s light blue, pupil-less eyes, gaze serenely somewhere beyond our vision. Like the Amida Buddha, she rests above a lotus blossom and holds her right hand in a mudra of blessing and teaching; the circle formed by the index finger and thumb is the sign of the Wheel of Law. In her left hand she holds a hojyu, or magical wishing jewel, in the shape of a lotus bud. This figure is inspired by Kichijoten, originally the Indian goddess, Shri Lakshmi, who was eventually incorporated into Buddhism, and typically represents fertility, fortune, and beauty. Here Mori bares comparison with a well-known eighth-century painting of Kichijoten from Yukushi-ji Temple in Nara. Similarities include the serene elegance, softly fluttering gown, and wish-granting jewel. 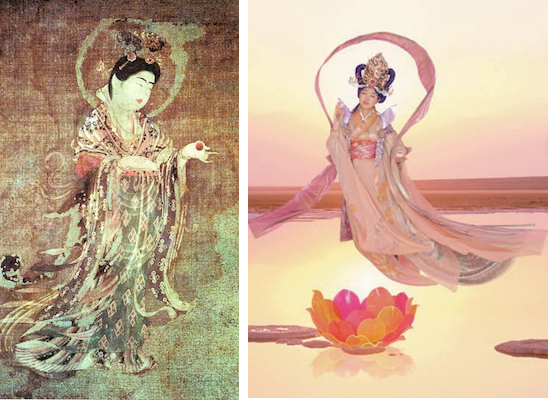 The eighth-century painting depicts the clothing and appearance of an elegant lady of the Chinese Tang Dynasty, and it may have been an object of veneration during the annual New Year event when devotees prayed for happiness and fertility. In this manner, a beautiful, elegant woman was seen to embody the ideas of good fortune and prosperity and became an object of worship. By taking on this ancient persona, Mori dissolves her own identity and is transformed into the elegant Tang lady and goddess of fortune, while simultaneously performing the welcoming role of Amida Buddha. Mori’s enlightened self-representation descends to guide the viewer into a “Pure Land of Perfect Bliss” of her own creation. Perhaps more significantly, the artist seeks to lead the viewer into her immersive paradise. In both formats, the multi-sensory video Nirvana and purely visual Pure Land photograph, the message is clear: enlightenment is for all. Cite this page as: Katrina Klaasmeyer, "Mariko Mori, Pure Land," in Smarthistory, November 20, 2015, accessed April 19, 2019, https://smarthistory.org/mariko-mori-pure-land/.